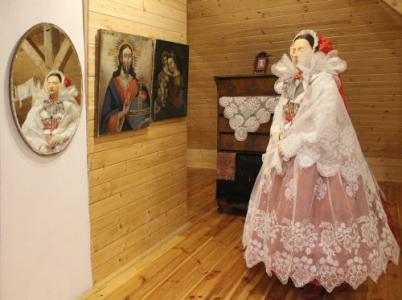 One of the most impressive outfits is the costume of a townswoman living in Żywiec. What attracts attention are primarily all the elements sewn with a richly embroidered tulle and a cap worn by married women, adorned with gold thread as well as purl, sequins and colourful gemstones, called a gold cap (copka). 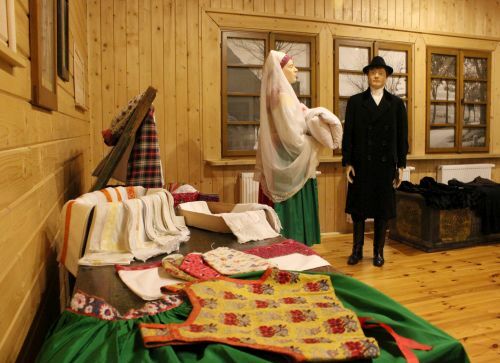 Clothes worn in Wilamowice are extremely colourful. The Museum of Bielsko-Biała can take pride in the most varied collection of those garments in Poland, which is why they are so widely presented at the new exhibition. 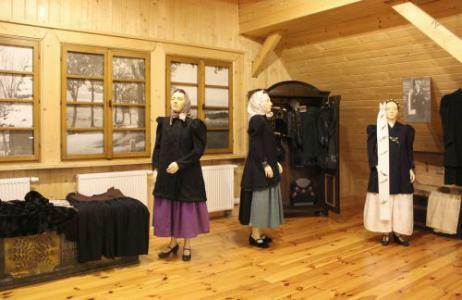 In that group, we can see the nicest costume worn by maidens, formal winter attire chosen by married women, more modest clothes worn by women in Wilamowice during Lent and Advent and extremely colourful daily garments. The most beautiful costume is worn by a godmother presented in the company of a godfather. 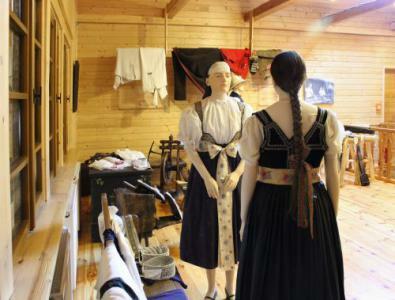 The traditional men’s outfit was lost in Wilamowice already at the turn of the nineteenth and twentieth century. In the interwar period the only characteristic element of the formal garment was a coat with a velvet collar, a so-called ibercijer. Against the multitude of colours, clothes of the Lasi, worn by women living near Biała, seem very modest and simple. Yet, this modesty is compensated by the quality of materials used in those garments: dark, factory-made fabrics and various haberdasheries sewn on very specifically cut caftans (jakle), shaping the look of the whole body. 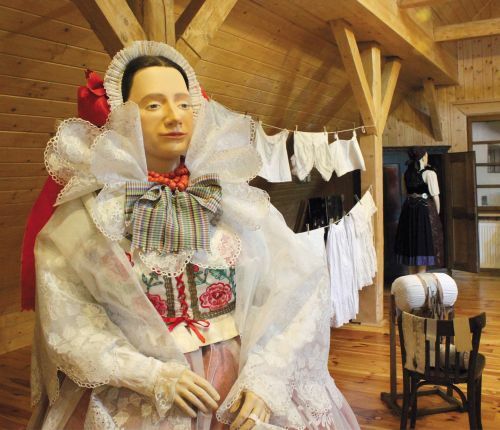 The ensembles presented at the exhibition come from Pisarzowice, which adjoin Wilamowice, from the area of Bestwina and Kozy (a bride’s wedding outfit). Clothes worn in the southern part of the territory of Pszczyna were not homogeneous, which can be seen when comparing the outfit of a married woman from Łąka, consisting of elements similar to those of costumes of Lasi (the married women’s cap and jakla are cut and decorated differently), with the clothes from Piasek, with a white cotton shirt, a dark dress and a striped, manually embroidered apron. 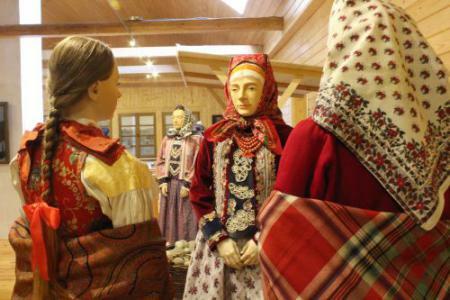 The most beautiful article of clothing typical of Cieszyn, worn in the area of Bielsko and called a Silesian attire was a velvet bodice sewn up with a dark woollen skirt – żywotek, embroidered first with gold or silver metal thread and in a later period with colourful silk one. 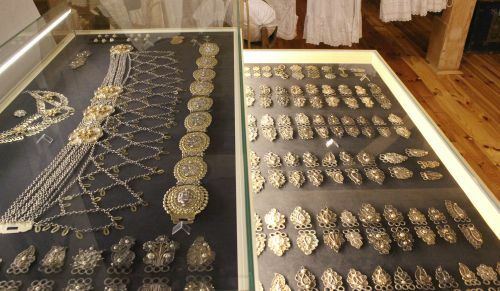 The attire of more affluent women was complemented by silver jewellery – a band, a necklace hung on the shoulder straps of żywotek, called napierśnik (breastplate), as well as breastpins (so-called hoczki) sewn up to the edges of żywotek. In the 1930s imitation jewellery came into vogue – bands made of colourful beads and sequins as well as breastpins, embroidered in a similar way on żywotki. 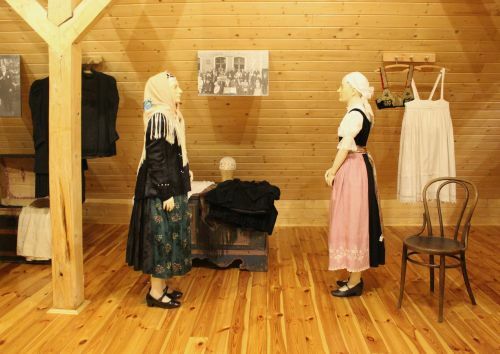 The exhibition boasts three examples of that outfit which show changes taking place in the clothes typical of Cieszyn in the interwar period – one comes from Jaworze, while the other two from the county of Cieszyn. Interesting exhibits shown at the exhibition are the costumes of Silesian Highlanders, still made of huckaback and broadcloth woven manually on the same looms as those presented on the display in the kitchen. Therefore, that part of the exhibition was also complemented by a presentation showing different stages of linen and sheep wool processing, which result in the creation of yarn. 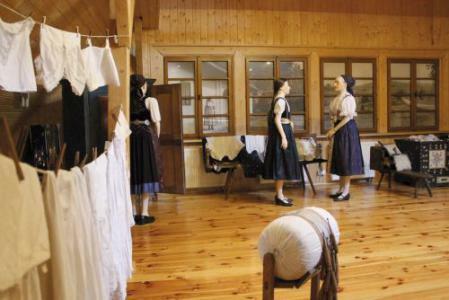 What also attracts attention are two pinafores worn by Highlander Women instead of a skirt – fortuszek at the front and a quite baggy and tightly draped linen fortuch at the back. At first, it was the so-called modrzyniec, dyed manually, using the technique of batik, which later was replaced by fortuszek made from damask silk. 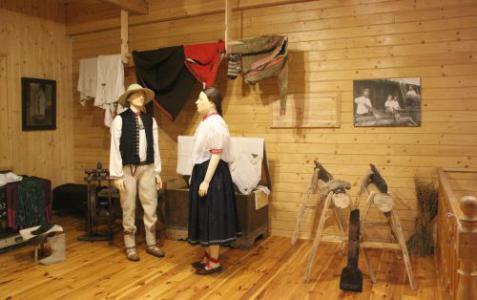 The outfit of a Silesian Highlander consisted of a linen, manually woven shirt (ćwilich) which like kabotek was decorated with cross-stitch patterns, white broadcloth trousers kept firmly on the waist by a leather belt (gabaryjok), a red or black broadcloth vest and a brown coat called gunia. The Highlander would put woollen socks on his feet – kopyca, tied around with a string from goat’s fur, and traditional shoes called kierpce. He would also put on a hat. The whole exhibition is complemented by furniture used to store clothes – ranging from painted chests, trunks, chests of drawers to wardrobes, as well as ladies’ lingerie, various outfit elements, beads and mainly silver jewellery.